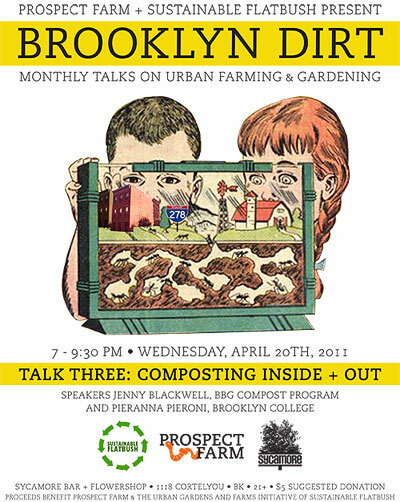 Brooklyn Dirt: Monthly Talks on Urban Farming and Gardening. Jenny Blackwell is project manager for the NYC Compost Project in Brooklyn. She is a graduate of Brooklyn Botanic Garden’s Horticulture Certificate Program. A composting fanatic, she has worked with composting systems at Added Value, the Hollenback Community Garden, BBG, and the Battery Park City Parks Conservancy, as well as the myriad systems that Brooklyn’s backyards and community gardens have to offer. Pieranna Pieroni is a Brooklyn Botanic Garden-trained Master Composter and educator (with a worm bin in her office at Brooklyn College) who works with New York City public school students around school-community gardening and ecoliteracy.